In solar thermal collectors, a selective surface is a means of increasing its operation temperature and/or efficiency. The selectivity is defined as the ratio of radiation-absorption (alpha) to radiation-emission (epsilon). 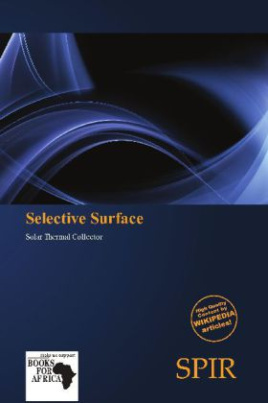 Selective surfaces take advantage of the differing wavelengths of incident solar radiation and the emissive radiation from the absorbing surface. Normally, a combination of materials is used. One of the first selective surfaces investigated was simply copper with a layer of black cupric oxide. Black chromium ("black chrome") nickel-plated copper is another selective surface that is very durable, highly resistant to humidity or oxidizing atmospheres and extreme temperatures while being able to retain its selective properties - but expensive. Another combination consists of steel plated with gold, silicon, and silicon dioxide.